Elohim had a very good reason in giving Nebuchadnezzar a dream and then in not allowing him to remember it and at the same time impressing him with its significance because “wherewith his spirit was troubled and his sleep broke from him” (Daniel 2:1). The dream bothered Nebuchadnezzar so much that heads were going to roll if someone did not tell him his dream and interpret it. Elohim knew what He was doing because if Nebuchadnezzar could remember his dream and then had told it to “the magicians, the astrologers, the sorcerers, and the Chaldeans” (Daniel 2:2), they might have fabricated an interpretation. It did not matter to them if it was a correct interpretation; just so it satisfied Nebuchadnezzar. But Elohim did not allow these supposedly wise men to become involved with this matter. They even told Nebuchadnezzar that “it is a rare thing that the king requires, and there is none other that can show it before the king except the gods, whose dwelling is not with flesh” (Daniel 2:11). Some things men are incapable of, no matter what men may say and telling someone their dream and then giving the correct interpretation is humanly impossible, but nothing is impossible with Elohim (Matthew 19:26). How does one know without a doubt that there is an Elohim (a Supreme Being)? Elohim throws out this challenge to the would-be pretenders to His position as Elohim (the Supreme Being). “Show the things that are to come hereafter, that we may know that you are gods” (Isaiah 41:23, emphasis added). “New things do I [Elohim] declare: before they spring forth I tell you of them” (Isaiah 42:9, emphasis added). So if there is an Elohim Who can foretell the future with 100% accuracy, should not that be enough to convince us of the reality of His existence? Yahushua told the people of His day, “If they hear not Moses and the prophets, neither will they be persuaded, though one rose from the dead” (Luke 16:31). No matter how much evidence is provided, some people will never be convinced but will always find some reason to doubt. You will see from this chapter that approximately twenty-five hundred years ago, Elohim gave the king of the greatest kingdom of that time a dream that foretold what would happen between then and now, and even foretold our future as well. Elohim wants our generation to know and understand this prophecy. He shows the foolishness of human wisdom by what He does and what He reveals, and only Elohim can and will explain through instruments of His own choosing what He desires us to know. The litmus test for prophets was that if what they predicted came to pass, they were legitimate; something that psychics cannot do 100% of the time. So it is with those of us who are seeking to understand the prophecies and what they mean to us today. If what you are reading in this book comes to pass, then you will know beyond a doubt that it is of Elohim because nearly everything you will read in this book is still in the future! You will see from what you have read and what you will read in this book, very specific events together with the timing of those events is given. Things are not so vaguely stated that you are never quite sure if what was predicted has happened or not. This is the methodology of the psychics but not with the prophets of Elohim. When the event along with the timing that is given has taken place, you will have no question in your mind as to whether it met its fulfillment of the prophecy that has been made. Prophecies are not idioms which mean something other than what is shown. Prophecies are not predictions. The prophecies of the Bible are foretelling of what is going to happen; not what might happen. There is no uncertainty in what is being foretold. Elohim has foreknowledge which He gives to mankind in the form of prophecies through His servants on this earth. Personally, I would hope that nothing that I have written would come to pass because of how tragic it will be for the many who will find themselves without a shelter in the time of trouble ahead. Words are inadequate to properly describe what is about to take place. We already have had a glimpse into what is to happen, but the imagination cannot conceive of its horribleness. It will be trying enough for those who “abide under the shadow of the Almighty” (Psalm 91:1). When Daniel became aware of what had been decreed against the wise men of the kingdom of which he was a part, he called for a prayer meeting with his companions in order to ask Elohim “concerning this secret” (Daniel 2:18). Do you think Daniel would have been able to know the dream and understand its interpretation without going to Elohim in prayer? Do you think you can understand it any more than he could without prayer? Elohim has promised to give us His Spirit to guide us into all the truth and show us things to come (John 16:13). “But the natural man receives not the things of the Spirit of Elohim: for they are foolishness unto him: neither can he know them, because they are spiritually discerned” (1 Corinthians 2:14). Elohim is more than willing to open everyone’s understanding to what He has written for our benefit and tells us if we ask for His help, He will give us His Spirit to guide us in coming to know for ourselves what is about to happen. See John 16:13. The truth is not for all men, but for only those who seek it. Daniel was shown the dream and its interpretation in “a night vision” (Daniel 2:19). In response, “Daniel answered and said, Blessed be the name of Elohim [which is Yahuwah] for ever and ever for wisdom and might are His: and He changes the times and the seasons” (Daniel 2:20, emphasis added). This is a most important fact to remember, because in our study of Daniel 7, a power described as “the little horn,” usurps Elohim’s authority and works “to change the times” and the seasons (Daniel 7:25). There are some things that man, no matter who he claims to be, has any right to do. Nowhere in the Bible do we find such permission given to anyone or to any organization. “He (Elohim) removes kings, and sets up kings: He gives wisdom unto the wise, and knowledge to them that know understanding: He reveals the deep and secret things: He knows what is in the darkness, and the light dwells with Him. I thank Thee, and praise Thee, O Thou Elohim of my fathers, Who hast given me wisdom and might and hast made known unto me now what we desired of Thee: for Thou hast now made known unto us the king’s matter” (Daniel 2:21-23, emphasis added). Daniel acknowledges that Elohim alone had made known to him what he was about to tell King Nebuchadnezzar. There is nothing for which he takes any credit. Why did Elohim give Nebuchadnezzar this strange dream? To show him what was to follow after him to the close of time? Yes, but that was not the main reason. “There is an Elohim in heaven that reveals secrets, and makes known to the King Nebuchadnezzar what shall be in the latter days” (Daniel 2:28, emphasis added). He gave him this dream to show him and now us what will be happening in the “latter days.” This dream was given mainly for us living in these last days of earth prior to the return of Yahushua, even though most of what is shown in this dream is now in the past and has already taken place. It gives us assurance that what is still foretold to happen in our days, will happen just as what was foretold in the past came to pass. Are we living in the “latter days” foretold in the book of Daniel? How can we know? See if the words written over 1,900 years ago answer that question. “This know that in the last days perilous times shall come. For men shall be lovers of their own selves, covetous, boasters, proud, blasphemers, disobedient to parents, unthankful, unholy, without natural affection, trucebreakers, false accusers, incontinent, fierce, despisers of those that are good, traitors, heady, high-minded, lovers of pleasure more than lovers of Elohim . . . but evil men and seducers shall wax worse and worse deceiving and being deceived” (2 Timothy 3:1-4, 13, emphasis added). Many contend that the Bible is outdated and not relevant for today. With such an accurate description of the times in which we are living given over 1,900 years ago, one wonders at those assertions! Can we see what Paul was describing taking place in our day or do you think that men are capable of becoming worse? It appears man is capable of becoming worse than what we are seeing today. With what is going on in the political arena at the present time there is no doubt that people are capable of becoming much worse. Are we living in perilous times? Mass killings, racial tensions, financial insecurity, terrorism, wars, nuclear fallout, pollution of air and water, threats of nuclear war, scandals, abortions, sexual perversion, serial killers, sexual immorality, indebtedness, outbreaks in nature (tornadoes, earthquakes, tsunamis, hurricanes, fires, and floods), and the list goes on. It seems like the Cold War we heard about when some of us were growing up was nothing in comparison to what our children and our grandchildren are facing today. It can become pretty depressing if we let our minds dwell on it, but we cannot ignore it altogether, can we? What does all this mean? Are these the means Elohim is using to wake man up and have us inquire what in the world is going on; to get us out of our complacency? We live among what we see going on in the world and have become so accustomed to seeing things as they are that maybe we do not think too much about it or take it as seriously as we should? We become numb to it all. There is a story of how to cook a frog and how that relates to us who are living today. If you want to cook a frog that is alive, you do not put him directly into boiling water. If you do so, he will immediately jump out. If you want to cook a frog that is a live to begin with, you place him in tepid water and turn on the heat. Frogs are amphibians whose bodies adjust to heat and cold. The frog’s body will acclimate to the heat until it is too late, and he is cooked to death. We are in danger of becoming acclimated to the world we live in and do not notice the subtle changes that have been occurring over time. Evil has been creeping in unnoticed by most living in the world today. What we would have considered appalling 60 years ago when I was a child is commonly accepted in the world today. Only by studying the Bible and seeing what standards Elohim has set for us can we keep our moral compass from becoming distorted and realize how far we have wandered from Elohim’s original design for humanity. Is there a solution to all that the world is facing? That is what we will discover as we continue with our study of Daniel and Revelation; the only solution! There is no human solution to the problems our world is facing today. We may ask why Elohim does not do something about the mess this world is in? Is He incapable of fixing what He has created? Or maybe you do not think anything is wrong on planet earth? While men debate the causes of these problems we face and search for solutions, Elohim has the solution to all of them. Because He does not act in our time and in our way, some lose their faith in Elohim. But the Elohim I have come to know and understand (Jeremiah 9:23-24), is all powerful, all knowing, and all loving, as well as merciful, and He will act in His own time and way. “Yahuwah is . . . longsuffering to us-ward, not willing that any should perish, but that all should come to repentance” (2 Peter 3:9). My wife often reminds me that Elohim has been quiet for a long time; surely He must be ready to rise up. “For Yahuwah shall rise up as in mount Perazim, He will be wroth as in the valley of Gibeon, that He may do His work, His strange work: and bring to pass His act, His strange act” (Isaiah 28:21). There are differences of opinion as to the interpretation of Nebuchadnezzar’s dream. From history and from what it says in Daniel 2:38, we know that Nebuchadnezzar’s kingdom was represented as the “head of gold.” It was succeeded by the Media-Persian Empire ruled by Darius and then Cyrus and others. Then came the Greek Empire originally ruled by Alexander the Great. And that kingdom was followed by the Roman Empire which lasted until approximately the fourth or fifth century AD. After the fall of the Roman Empire, it was divided into ten groups of people as shown in Daniel 7:7, 24. Many of the commentaries I have reviewed say that the ten toes are the same as the ten horns mentioned in Daniel 7. But are they? Without going into a lot of detail, these are some of the issues I have with that interpretation. 1. It says in Daniel 2:44, that “in the days of these kings shall the Elohim of heaven set up a kingdom” (an everlasting kingdom). By this I am assuming that there are ten kings, represented by the ten toes, who will be in power on the earth at the time of Yahushua’s return. Five toes per foot times two equals 10. I don’t like to assume anything, but I believe this has some merit. 2. In the discussions of Daniel 2, it is stated that these ten toes represent the countries of Europe which make up the European Union. But there is reason to question this, because the European Union, which is said to be here represented, consists of more than ten nations. At the present time there are twenty-eight countries within the European Union. And now that the European Union seems to have begun to disintegrate with Britain soon to be leaving and others may be following, how could this be true? This just doesn’t fit with the ten toes or with even the ten horns of chapter seven. If Elohim uses toes, then ten will be what is represented. He is also quite definite in stating there are ten horns in Daniel 7. He was not trying to make it difficult to understand, but we can certainly make it difficult by trying to force a square peg into a round hole and putting our own spin on it rather than take the Bible for what it says. 3. Also, what is represented by the ten horns in Daniel 7 included much of Northern Africa and the Middle East and not just the European nations. 4. We must also consider the feet mentioned in Daniel 2:41. Do we go right from the legs of iron to the toes thus bypassing the feet? What are represented by the feet of iron and clay? They are of the same material as the toes, but they must come into play and represent something? Other body parts did, why not the feet? 5. Also the “little horn” of Daniel 7 plucks up three horns leaving only seven of the original ten horns. These are five reasons I do not see “eye to eye” with others on the ten toes. After the fall of Rome, there was a mixture of state and church (represented by the mixture of iron and clay) that strove to gain control; sometimes they united with one another to carry out their purpose. But like clay and iron, they did not hold together for long. There have been attempts through conquest and through marriage (“they shall mingle themselves with the seed of men” [Daniel 2:43]) to unite the European peoples, and re-establish the Roman Empire, but never with lasting results. Adolph Hitler came close to accomplishing this, but he too failed. Are we going to see a ten-toed kingdom, with a mixture of church and state (iron and clay), in the last days, before Elohim takes a “stone cut out of the mountain without hands” (Daniel 2:45) to destroy the mighty image which King Nebuchadnezzar saw? We are told in verse 45 that “the dream is certain and the interpretation thereof sure.” We can only say, Amen! Here is where we go into the future which time alone will either verify or nullify what I am writing. But to those who have faith in Elohim and in His Word, we have these words, “Blessed are they that have not seen, and yet have believed” (John 20:29). If a father tells his son he has a new bike in the car for him, the son will take his father at his word even though he has not actually seen the bike. Do we have such a faith and confidence in our heavenly Father? Why not? Maybe we do not know Him well enough yet? Let us take the time to get to know this wonderful Elohim, our Creator, our heavenly Father! “Except you be converted, and become as little children [having confidence and trust in what is told you without having any evidence that what you are told is true], you shall not enter into the kingdom of heaven” (Matthew 18:3). Oh, to have that trust and confidence of a little child in our heavenly Father and give heed to and believe what He tells us in the Bible! I remember my wife’s little grandson who was two at the time climbing onto the hassock and then without warning leaping off of it into the arms of my shocked wife who threw out her arms to catch him! He knew his grandma would not fail him. And then it was a continuous climbing onto the hassock and throwing himself at my wife. Once we experience Elohim’s ability to catch us, do we throw ourselves at Him? “And He said unto me, thou must prophesy again before many peoples, and nations, and tongues, and kings” (Revelation 10:11). What does it mean to prophesy? To foretell the future with certainty! We have already looked into the future in Revelation 8 and 9. But to foretell the future based on what; dreams? visions? on the headlines in the news? or on what the Word of Elohim says? “And I took the little book out of the angel’s hand, and ate it up; and it was in my mouth sweet as honey: and as soon as I had eaten it, my belly was bitter” (Revelation 10:10). The “little book” is the Bible as you will see in the chapter on Revelation 10, 11, and 15. We can actually look into the future by studying Elohim’s Word; specifically the books of Daniel and Revelation. We do not need a crystal ball to see into the future! “We have a more sure word of prophecy” (2 Peter 1:19) that we can study and discover for ourselves the future when Elohim by His Spirit guides us into all the truth and shows us things to come (John 16:13). Is there a ten-toed kingdom in the future of this world? When we come to the chapter on Revelation 13, we will meet a beast with ten horns and seven heads representing an amalgamation of religious and political powers. We spend some time on our website (See our website address at the end of this book.) dealing with secret societies. Some may question whether there really are such societies? The following is taken from the book entitled Enroute to Global Occupation. “The Club’s [Club of Rome] findings and recommendations are published from time to time in special confidential reports, which are sent to the power-elite to be implemented. On 17 September 1973, the Club released one such report, entitled Regionalized and Adaptive Model of the Global World System prepared by COR members Mihajh Mesarovic and Eduar Pestel. “The document reveals that the Club has divided the world into TEN POLITICAL/ECONOMIC REGIONS, which it refers to as ‘KINGDOMS’ . . . While these ‘KINGDOMS’ are not set in concrete and changes could still occur, it gives us an idea of what lies ahead. “And in the days of these kings shall the Elohim of heaven set up a kingdom, which shall never be destroyed: and the kingdom shall not be left to other people, but it shall break in pieces and consume all these kingdoms, and it shall stand for ever” (Daniel 2:44, emphasis added). 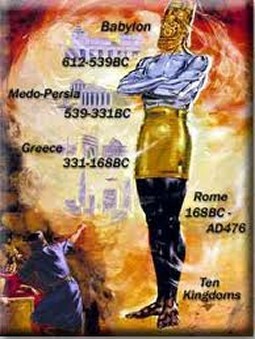 The New World Order is the ten-toed kingdom with a mixture of “iron and clay” (political and religious) that Daniel foretold, but is there still another “ten horn” kingdom in the future beyond this “ten political/regional kingdom?” When we come to Revelation 17, we will see “ten horns which thou saw are ten kings, which have received no kingdom as yet; but receive power as kings one hour [a very short period of time – In today’s world we would say ‘just a minute.’] with the beast” (Revelation 17:12). The New World Order, which will reign for 42 months (Revelation 13:5), is the “ten political/regional kingdom” and is the last human kingdom on the earth is not expecting this and will be taken completely by surprise when it occurs. This is discussed in future chapters. Even though what we will be facing will be horrific, we can look beyond, to see a very glorious and unending future with Elohim, the Father, and His only begotten Son, our Master and Savior, Yahushua Messiah! 1. Who alone has the right to change the times and the seasons? 2. Who alone can show what is going to happen in the future? 3. Does Daniel chapter two have anything to say about the future of this world? 4. How does Elohim communicate to people of this world?